• An Electronic Capacity measurement system in the front passenger seat which detects major characteristics of a person or object on the seat. • Electronic system to determine whether the passenger air bag systems (both front and side) should be activated or deactivated. • A warning light located on the instrument panel which illuminates the words "PASSENGER AIR BAG OFF" indicating the front passenger air bag system is deactivated. 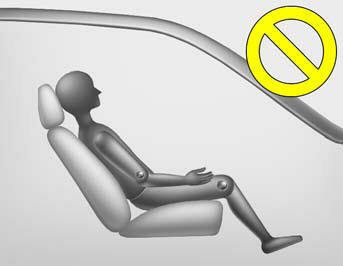 If the front passenger seat is occupied by a person that the system determines to be of an appropriate size, and he/she sits properly, the "PASSENGER AIR BAG OFF" indicator will be turned off and the front passenger's air bag will be able to inflate, if necessary, in frontal crashes (sitting properly means sitting upright with the seatback in an upright position, centered on the seat cushion with their seat belt on, legs comfortably extended and their feet on the floor). (4) Putting legs on the dashboard or resting them on other locations. (7) The seat covering change and/or blanket use. *1) The OCS system uses a field to evaluate a person's size to determine whether the airbag should deploy. It is possible for a child to be detected and activate the OCS, thus allowing the airbag to deploy. To maximize safety, do not allow children to ride in the front passenger seat. *2) Never install a child restraint system on the front passenger seat. 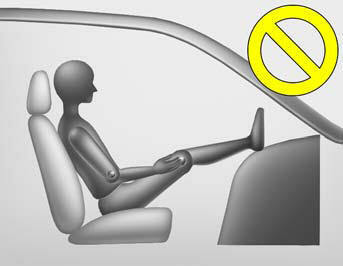 Riding in an improper position or placing weight on the front passenger's seat when it is unoccupied by a passenger adversely affects the occupant classification system (OCS). Your OCS is designed to resist electronic waves, but do not place an electronic device such as laptop computer on or near the seat cushion since it may defeat the proper functioning of the OCS. 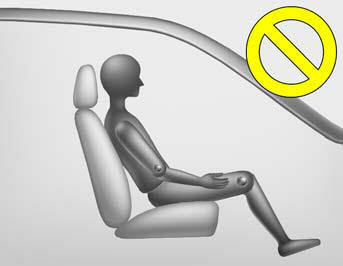 When an adult is seated in the front passenger seat, if the “PASSENGER AIR BAG OFF” indicator is on, turn the ignition switch to the LOCK position and ask the passenger to sit properly (sitting upright with the seat back in an upright position, centered on the seat cushion with their seat belt on, legs comfortably extended and their feet on the floor). Restart the engine and have the person remain in that position for about 30 seconds. This will allow the system to detect the person and to enable the passenger air bag. If the "PASSENGER AIR BAG OFF" indicator is still on, ask the passenger to move to the rear seat. 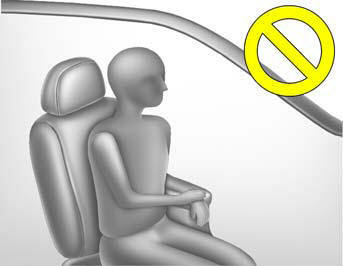 Do not allow an adult passenger to ride in the front seat when the “PASSENGER AIR BAG OFF” indicator is illuminated because the air bag will not deploy in the event of a crash. 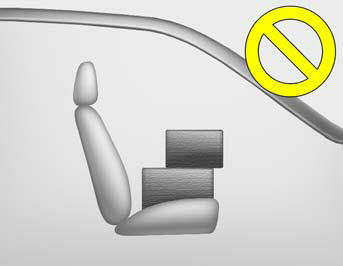 If the "PASSENGER AIR BAG OFF" indicator remains illuminated after the adult passenger repositions themselves properly and the car is restarted, it is recommended that passenger move to the rear seat because the passenger's front air bag will not deploy. The "PASSENGER AIR BAG OFF" indicator illuminates for about 4 seconds after the ignition switch is turned to the ON position or after the engine is started. If the front passenger seat is occupied, the occupant classification sensor will then classify the front passenger after several more seconds. Do not put a heavy load or an active electronic device (ex. laptop computer, navigation etc..) in the front passenger seatback pocket or on the front passenger seat. Do not hang onto the front passenger seat. Do not hang any items such as seatback table on the front passenger seatback. Do not place feet on the front passenger seatback. Do not place any items under the front passenger seat. Any of these could interfere with proper sensor operation. o Riding in an improper position or placing weight on the front passenger's seat when it is unoccupied by a passenger adversely affects the occupant classification system (OCS). - Never put a heavy load or an active electronic device (ex. laptop computer, navigation, blanket etc) on the front passenger seat. - NEVER lean on the door trim. WARNING: o Even though your vehicle is equipped with the occupant classification system, never install a child restraint system in the front passenger's seat. A deploying air bag can forcefully strike a child resulting in serious injuries or death. Any child age 12 and under should ride in the rear seat. Children too large for child restraints should use the available lap/shoulder belts. No matter what type of crash, children of all ages are safer when restrained in the rear seat. o If the front passenger seat is occupied by a child who is not in a CRS, the "PASSENGER AIRBAG OFF" indicator may or may not be on and the passenger airbag may or may not deploy in a collision. Have the child move to a rear seat to increase their safety. o Do not modify or replace the front passenger seat. Don't place anything on or attach anything such as a blanket or seat heater to the front passenger seat. This can adversely affect the occupant classification system. o Do not place sharp objects on the front passenger seat. These may damage the occupant classification system, if they puncture the seat cushion. o Accident statistics show that children are safer if they are restrained in the rear, as opposed to the front seat. It is recommended that child restraints be secured in a rear seat, including an infant riding in a rearfacing infant seat, a child riding in a forward-facing child seat and an older child riding in a booster seat. o Air bags can only be used once – have an authorized HYUNDAI dealer replace the air bag immediately after deployment. o The occupant classification system may not work properly if water, coffee or any other liquid including rain gets on the seat. Keep the front seat dry at all times. o Do not place an electronic device such as a laptop computer on the front passenger seat. Its electronic field may cause the OCS to switch to the "on" condition and thus allow the passenger airbag to deploy needlessly in a collision, increasing your repair costs. will illuminate because the passenger's front air bag is connected with the occupant classification system. If there is a malfunction of the occupant classification system, the "PASSENGER AIR BAG OFF" indicator will not illuminate and the passenger's front air bag will inflate in frontal impact crashes even if there is no occupant in the front passenger's seat. If the SRS air bag warning light does not illuminate when the ignition switch is turned to the ON position, remains illuminated after approximately 6 seconds when the ignition switch is turned to the ON position, or if it illuminates while the vehicle is being driven, have an authorized HYUNDAI dealer inspect the occupant classification system and the SRS air bag system as soon as possible.